It is a central theme of this blog that Barack Obama was promoted to the presidency of the United States, by several Marxist groups including Democratic Socialists of America. While this sounds far - fetched to some, there is nothing new about socialists working inside the Democratic Party to put "their" candidates into very high positions. The late Millie Jeffrey was a leader in the United Auto Workers and an high ranking Democrat for decades. In 2000 President Bill Clinton presented Millie Jeffrey, with the nation's highest civilian honor bestowed by the U.S. Government, the Presidential Medal Of Freedom, with a citation, saying those awarded "have helped America to achieve freedom." In the 1950 and 60s, Jeffrey was a Democratic Party National committeewoman from Michigan. In 1960, she helped campaign for John F Kennedy, as a member of the Democratic National Committee. Less publicized were the facts that Millie Jeffrey was also a long time leader of Democratic Socialists of America, a 'midwife' to the radical Students for a Democratic Society and a veteran of the communist infiltrated Womens International League for Peace and Freedom. 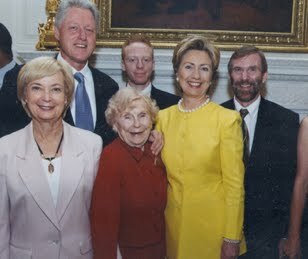 According to Democratic Socialists of America member and prominent journalist Harold Meyerson, Millie Jeffrey remained highly influential inside the Democratic Party. That wasn't all Millie Jeffrey achieved. She and a group of "co-conspirators" succeeded in placing left leaning Geraldine Ferraro on the Democrat ticket as the Party's first female vice Presidential candidate. augmenting Ferraro’s visibility and bona fides, and as a result of “Millie’s strategic thinking,” says Howes, the group successfully pressured the party and Walter Mondale to make Ferraro chair of the convention platform committee. The rest is herstory. This is a good insight into how the US left works inside the "Democratic" Party. A small group of Party 'insiders', led by a well connected socialist, had a good shot at putting 'their' candidate into the Number 2 spot in the White House. Let's all be thankful for Ronald Reagan. Doesn't sound far fetched to me. In fact, I think their actions are becoming more obvious by the day. good article to link it to Farrakhan. Makes chilling sense to me. He was their ideal candidate because "Political Correctness" and/or fear of being labeled a racist keeps too many people silent when they should be screaming from the roof tops. Thank you for continuing to expose the truth. Oi Trev, looking at the above photo I was wondering when are you going to cover Al and Tipper’s marriage break-up, mate? The Gores were the ‘poster couple’ of what is great about God-fearing right-wing America and in contrast the Clintons were the off-spring of Beelzebub. So given Bills and Hillary’s well-publicised marital issues, it’s interesting they could reconcile and maintain a relationship. Yet here’s Al and Tipper (who at one stage wanted to censor music CD’s) who can’t make their marriage work and used in the most despicable way the Clintons marital problems politically to strengthen his position with voters. Was Al caught with an intern under his desk? An investigative journalist like you must surely have all the gossip (or 'truth' as you like it to be known)why Al Gore and his mrs have split? I'm waiting with baited breath for all the gossip about the sanctimonious Gores now sleeping in different beds. Canterbury, mate... The Gores being "right wing" (haha! big laugh when I read that)... do all NZ accents sound exactly like Australians? Does sugar taste exactly like salt? Republican Al Gore was quick to throw the sh*t around when Bill & Hillary where having their issues and when there was a vote in it for him. Now he needs to expect some of it back and the same with his stupidly named wife who wanted to censure all music CD’s. She’s just as sanctimonious as her hubby. $20 bucks says there’s been some stray-rooting taking place. PS: This blog use to be so much better when it dealt with local politics. ... what planet u on Canterbury?